MGP Ingredients Launches Eight & Sand Blended Bourbon Whiskey | MGP Ingredients, Inc.
ATCHISON, Kan., Feb. 7, 2019 /PRNewswire/ -- MGP Ingredients (Nasdaq: MGPI),has launched Eight & Sand Blended Bourbon Whiskey, a blend of fine bourbons and whiskies inspired by the American railroad. Eight & Sand refers to the eighth (and fastest) notch on a locomotive's throttle and the sand used on the wheels to prevent slipping. To wish a train crew an "Eight & Sand" is akin to "smooth sailing." Eight & Sand celebrates the timeless journey along the American railway with a classic tribute whiskey crafted by the MGP distillery team in historic Lawrenceburg, Indiana. "We're proud to position Eight & Sand as an engine of innovation in our portfolio," says Andrew Mansinne, Vice President of Brands, MGP Ingredients. "We were inspired by the story of the American railroad, and Atchison's local E&S Locomotive 811 which has long connected our hometown to the country. We've designed Eight & Sand as an approachable blend of bourbons and whiskies designed to appeal to consumers looking for great value, great quality and smooth taste." Eight & Sand Blended Bourbon Whiskey, the newest member of MGP's Rack House Series, is a blend of bourbon and whiskies married together to create a smooth and satisfying experience in every sip. The nose and palate deliver spicy rye and cinnamon notes, followed by a touch of caramel at the caboose. There are no additives or colors – just the good stuff: quality, blended bourbon whiskey. Offered at a SRP of $29.99 (750-ml), Eight & Sand is competitively priced to appeal to consumers at every stage of their whiskey journey. Whether it's crossing with your favorite mixer or riding the rails all on its own, Eight & Sand is a whiskey whose craftsmanship honors the railroad legends that built this country. 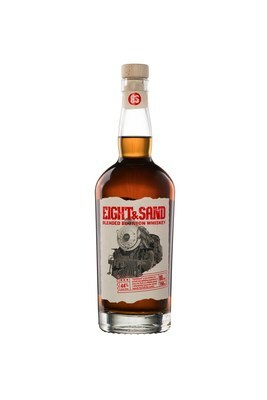 Eight & Sand Blended Bourbon Whiskey is dedicated to supporting American Railroad Museums and historic preservation. Eight & Sand will be available in Arizona, Colorado, Illinois, Indiana, Kansas, Kentucky, Minnesota, Montana, Missouri, Nebraska, Texas and Wisconsin. For more information, including samples and product photography, please contact: Amanda Davis, amanda@gregoryvine.com or Helen Gregory, helen@gregoryvine.com. Eight & Sand Blended Bourbon Whiskey, the newest member of MGP's Rack House Series, is a blend of incredible bourbon and whiskies married together to create a smooth and satisfying experience in every sip. The nose and palate deliver spicy rye and cinnamon notes, followed by a touch of caramel at the caboose. There are no additives or colors – just the good stuff: quality, blended bourbon whiskey. Offered at a SRP of $29.99 (750-ml), Eight & Sand is competitively priced for smooth sailing ahead. Eight & Sand Blended Bourbon Whiskey supports great American Railroad Museums and historic preservation. Connect with us: EightandSandWhiskey.com, and Facebook (@eightandsandwhiskey). Distilled and blended by MGP Distilling, Lawrenceburg, IN, 44% ALC/VOL. Keep it on the Rails. Enjoy Eight & Sand Responsibly.